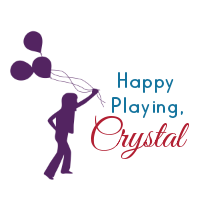 I am so excited to share this next activity. This has been one of Rosie's all time favorites so far, and it really is sure to delight and WOW any child. 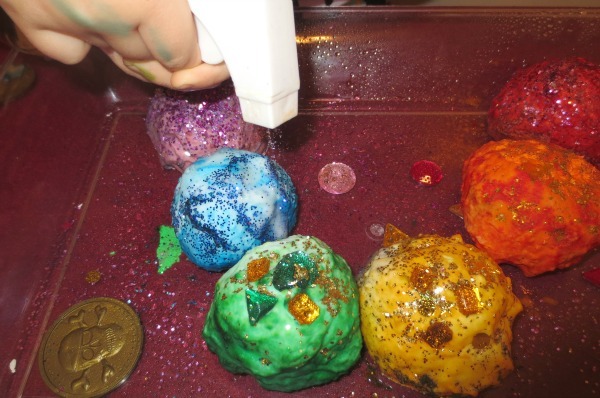 What could be more fun than Magic FIZZING Rocks with treasures hidden inside? Rosie was seriously in awe! 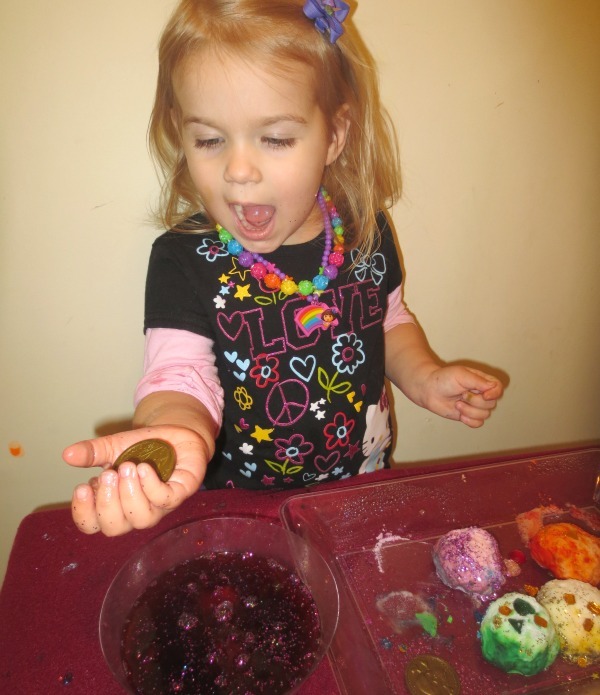 Making these magical rocks is easy and the activity has elements of science, sensory, and imaginative play, too. Add the desired amount of baking soda to a bowl. 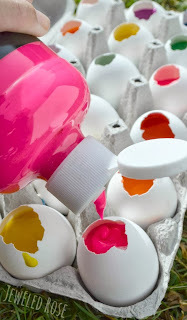 Add a few drops of food coloring if color is desired. Then slowly add water and mix. 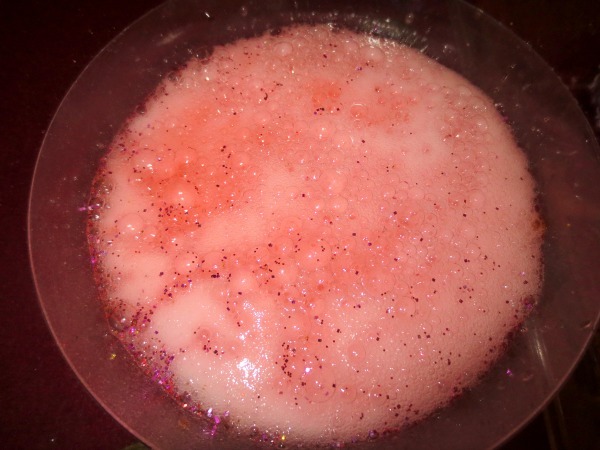 SLOWLY add more water until the mixture is damp and mold-able, but not too wet. It is easy to add too much water, so you definitely want to add it slowly. If you do accidentally add too much water just add a touch more baking soda. 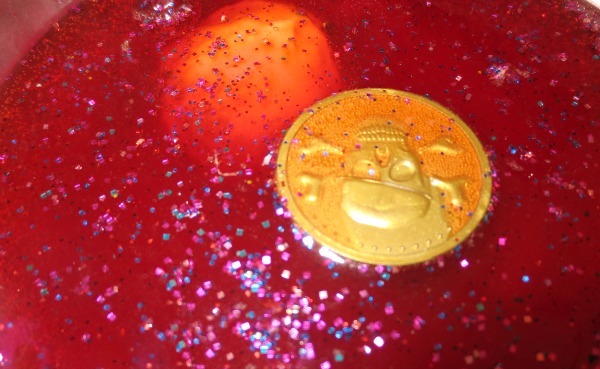 Once mixed mold the baking soda dough into balls, hiding treasures inside. Then lay the baking soda rocks out on a cookie sheet or similar to dry. Drying will take roughly 24 hours. Once dry you can either give them right to your child, OR you can bury them outside and let your child go on a treasure hunt. 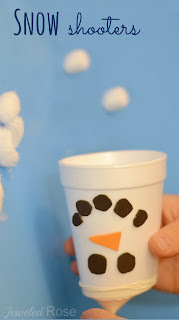 A back yard treasure hunt adds to the fun but either way is sure to wow the kids, so definitely don't wait for sunshine or Summer to make up a batch of these. You can always make them again! We have made these several times, and they are always a hit, even when I just surprise Rosie with them in the morning. On this particular morning I set Rosie up with a bowl of vinegar, a pipette, and a spray bottle of vinegar. You can get vinegar by the gallon at Walmart for under $3. 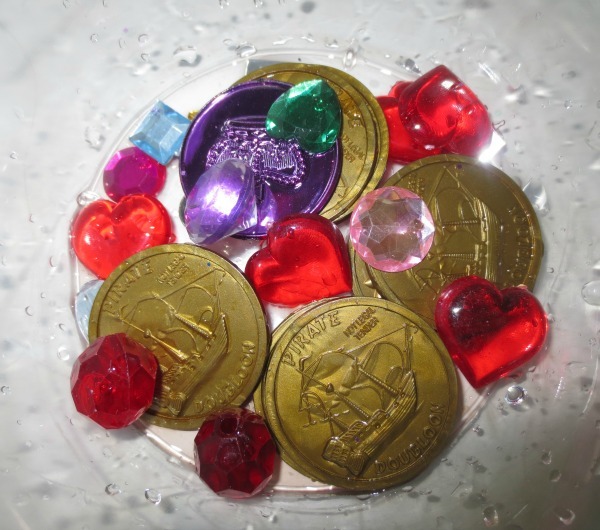 I placed the MAGIC Treasure Rocks in a shallow dish and Rosie set out to free the treasures. Then Rosie spent the morning pretending to be a pirate, one of her favorite roles. 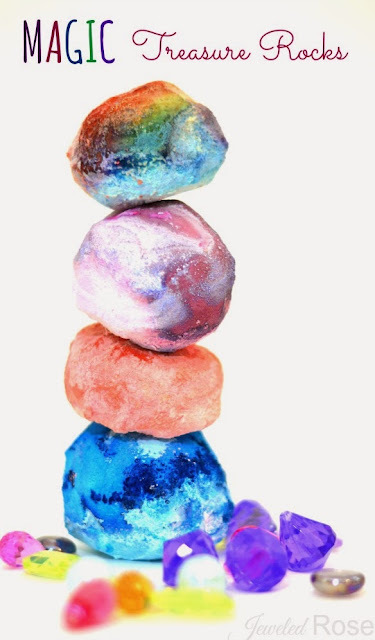 A Few Tips: If you want to make a RAINBOW of rocks like we did you will need to mix each color separately. 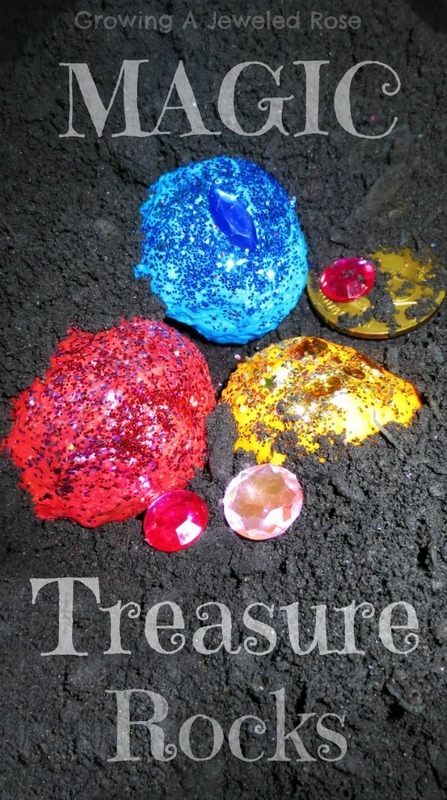 Kids can also use a play hammer and mallet to free the treasures from the rocks. The rocks break open fairly easily. 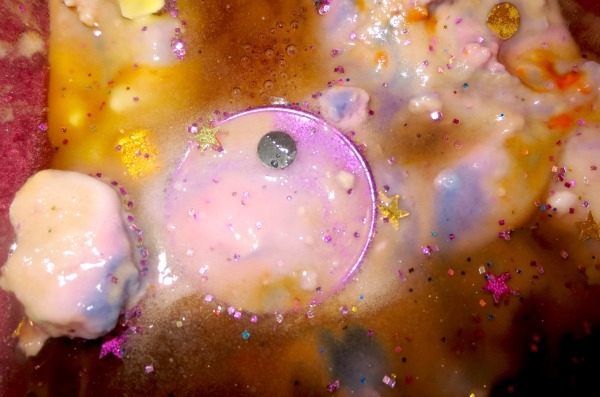 These also make fun bath bombs. 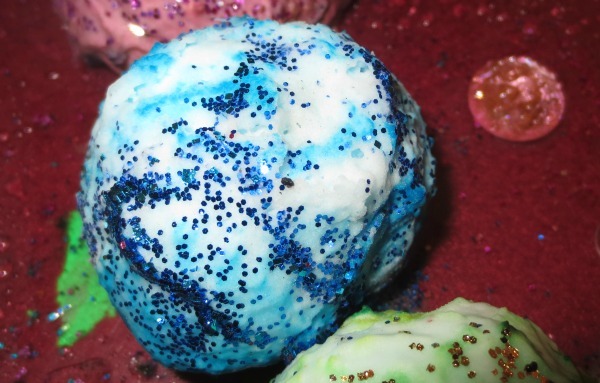 All you have to do is toss them in the tub for a fun way to play. 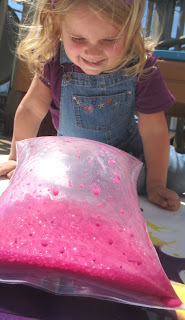 Rosie loves watching them dissolve to reveal the treasures, and baking soda is really good for the skin. You can hide all sorts of things inside including baby dinosaurs. 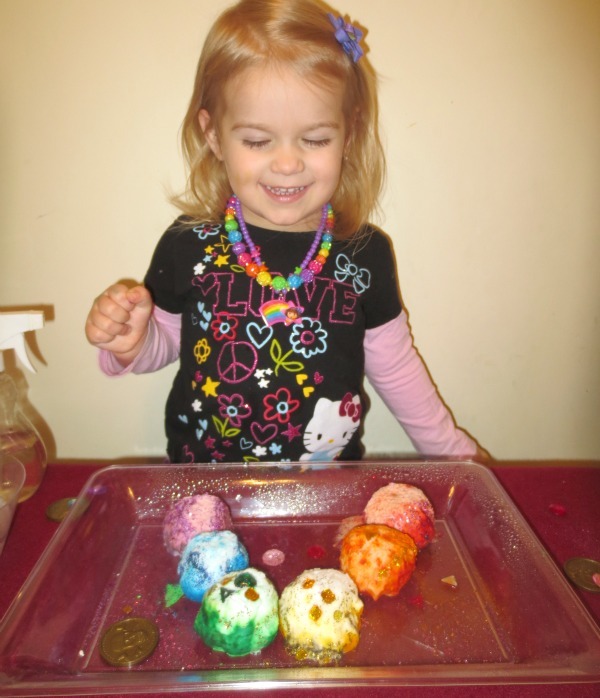 See our dinosaur eggs post for another fun way to play.